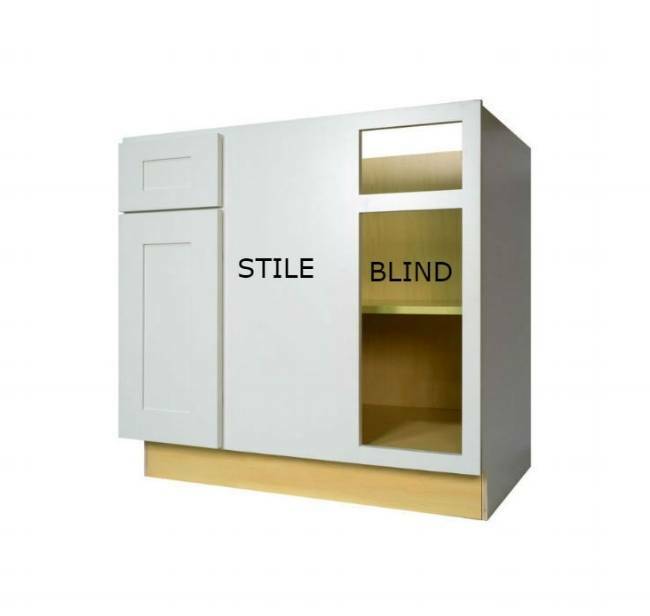 A blind base cabinet is a piece used in a corner to transition from one wall to another without leaving a large empty/void space in a corner; it is also used when a traditional corner cabinet such as a Lazy Susan is not preferred or won’t fit the available space. The blind base has a door/drawer on one side and an open/void space on the other so it is almost as if it is missing a door on one side, but that’s what makes this piece work. The side with the door will be the side you see in your kitchen and the blind or void side will be hidden by the adjacent cabinet. The stile in the center of that cabinet that prevents you from being able to see through to the inside of the cabinet once the kitchen is installed. As you’ll see from the image below there is a space or gap from the wall on the right to the BBLC (Blind Base Cabinet). This is called a “pull”. When installing your blind base you’ll need to pull it away from the wall so it is not sitting tight against it. 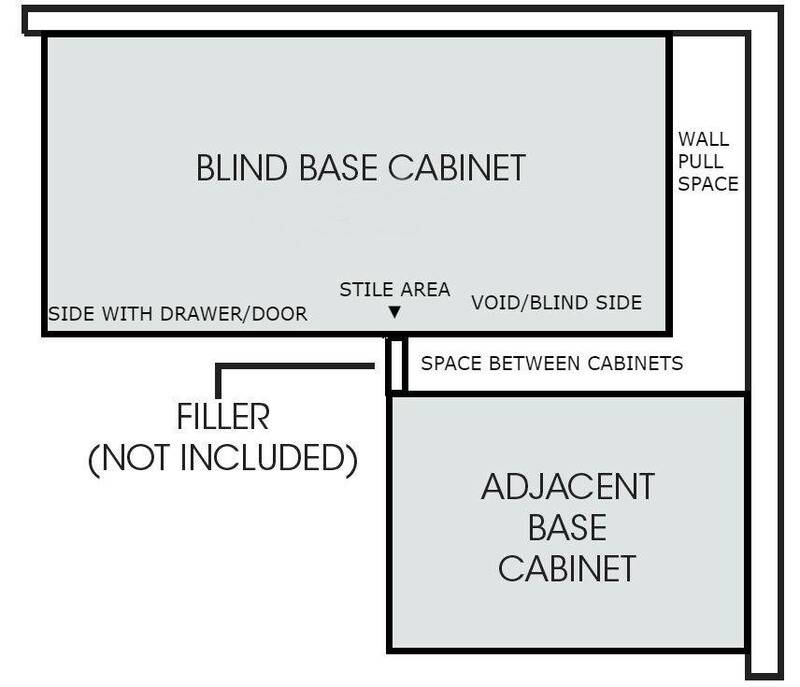 Most Blind base cabinets have a minimum and maximum pull which will depend on the style or cabinet line you are working with. Typically a minimum pull is 3” and a maximum is 5” – 8”, again, depending on the style. The pull is necessary because otherwise you would be trying to reach all the way back to that corner wall and the only way to do that is to practically crawl inside! From the image below you’ll see a filler piece that is installed between the blind base cabinet and the adjacent cabinet. The filler is necessary to prevent your doors and drawers from hitting into the other cabinet or it’s knobs that stick out. 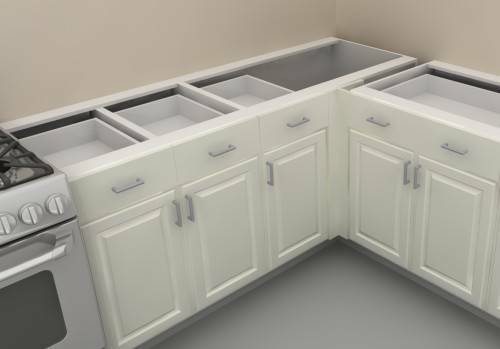 Without the filler or without a wide enough filler, you may end up with cabinets that have doors and drawers that don’t open all the way or at all. When you try to open them they will hit into each other. Keep in mind that the door and drawer fronts on your cabinets will stick out 3/4” – 5/8” beyond the interior depth or framing, and then you add hardware such as your knobs or handles which stick out further. **If your cabinet has inset doors/drawers then the concern is only the hardware. The filler piece is critical in making a blind base configuration successful. The filler is typically 2” – 3” wide but can be a larger width if your design calls for it. It is recommended that the filler be at least 3” wide. 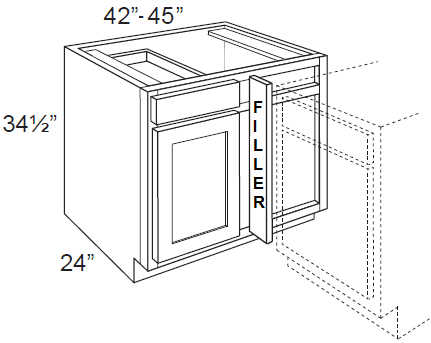 If you are working with frameless cabinets a 3” – 4” filler is recommended. If you have an appliance, such as a dishwasher or range adjacent to the blind base cabinet, be sure to know the depth of any handles on it so you can determine the appropriate filler size you’ll need in order for the appliance to open properly and clear the adjacent cabinet and its hardware. The standard blind base will only use a depth of 24” on the left wall allowing the adjacent cabinet to sit that much closer to the corner. If you were using a Lazy Susan or a square corner cabinet you would need 33”- 36” (standard) on each wall. Once installed it looks like the above corner and you’ll see the blind base is on the left with the adjacent cabinet on the right. When your kitchen is complete you’ll never know what’s there. This cabinet offers a lot of storage space and for those who don’t want to try reaching way back inside of it there are great shelving systems that insert into the blind base like the ones you see above.